The one and two bedroom homes at Tria Apartments boast all the features and amenities you need to live your best life in Newcastle, Washington. Easily commute to local employers like Microsoft and T-Mobile from your home on Newcastle Way. After work, relax on the rooftop deck with our two 50-inch outdoor TV’s, or watch the sunset over the trees. 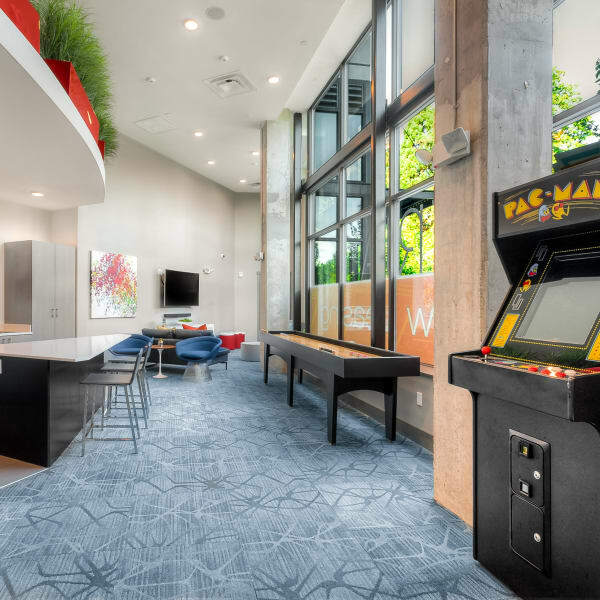 The resident clubhouse includes a community lounge complete with a 70-inch flat screen tv, free arcade games, shuffleboard and a kitchen. Our pet-friendly community is close to numerous parks and nature areas, so you can take the pup on a stroll without ever leaving the neighborhood. Your one or two bedroom apartment in Newcastle is modern, stylish, and ready for your personal touch. Hardwood floors are an easy-to-clean option, and stainless-steel appliances in the kitchen keep things looking sleek. Enjoy your morning cup of coffee in the fresh air on your private balcony or patio. Your in-home washer and dryer helps your wardrobe stay looking its best, and your generously sized walk-in closet will keep your clothes organized and ready to go. Discover an elevated way of living at Tria Apartments. Schedule a tour of our one and two bedroom apartments for rent in Newcastle, WA, today.